We don’t need to worry too much about sentient computers taking over the world, at least judging by this new short sci-fi film written completely by an artificial intelligence. 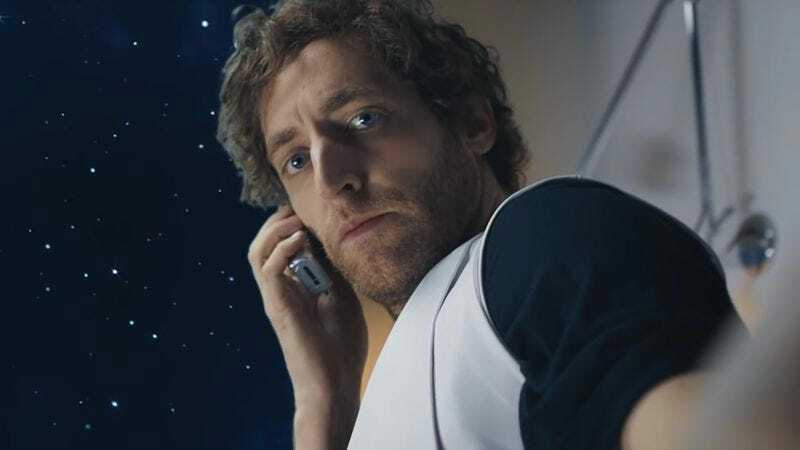 The script is virtual jibberish, but that didn’t stop filmmaker Oscar Sharp and actors like Silicon Valley’s Thomas Middleditch from turning it into a weighty, if nonsensical, nine-minute short called Sunspring. Inspired by Google’s AI beating humans in the game of Go, Sharp and his technologist collaborator Ross Goodwin decided to build an LSTM RNN artificial intelligence that could write screenplays. Nicknamed Jetson and later renamed Benjamin, they “taught” the machine by feeding it dozens of sci-fi screenplays, including everything from 2001: A Space Odyssey to Cowboys & Aliens to Eternal Sunshine Of The Spotless Mind. Sharp and Goodwin then entered specific prompts from a sci-fi writing contest as a framework, which included a title, a line of dialogue, a piece of action, and an optional setup (“In a future with mass unemployment, young people are forced to sell blood”). The AI spit out a screenplay, which Sharp and his cast and crew filmed in only 48 hours. While Sunspring was ostensibly conceived as a testament to the power of the computer, it winds up serving more as a testament to the creativity of human beings, who can use acting, cinematography, and music to wring real pathos from nonsense.